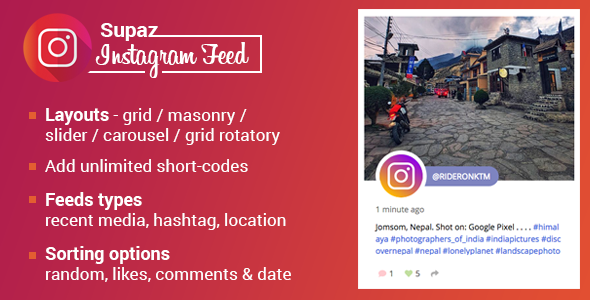 Supaz Instagram feeds is a user friendly premium WordPress plugin to display your Instagram feeds in your WordPress site anywhere in posts or pages. It will take just a minute to configure the plugin and it’s ready to use it on your site. Our plugin allows you to showcase your recent medias, hashtag and feeds by location. We offer great customization features that suites your needs. Take the full advantages of plugin for displaying various Instagram feeds with filter options so that you can keep the unnecessary feed images aside. Our plugin is multipurpose plugin it will best suites for bloggers, photographer, traveler or any one who are willing to showcase Instagram feeds on your site. 20+ different layouts with responsive designs that suites in all devices and various configuration parameters for each layouts make our plugin best suites to display your Instagram feeds on your WordPress sites. Our plugin includes grid/masonry layouts, carousel layouts, slider layouts and grid rotatory layouts. Make the multiple Instagram feeds appears as per your need with different shortcodes in the same page. Can use different access token for each shortcode. Image size – thumbnail, low resolution and large resolution. Sorting options – random, likes, comments and posted date. Number formats selection options for likes and comments count. Feed moderation – moderate the feeds by usernames and image captions. Cache settings – Enable the cache of the feeds so that each time there will be no API call overhead. You can set the cache durations in minutes. Layouts available – grid layout, masonry layouts, slider layouts, carousel layouts and grid rotatory layouts. We will constantly update our plugin with new layouts in our upcoming plugin updates. For each layouts get lots of templates selection options. For gird/masonry layouts you can use item animation, select the columns for desktops, tablets, and mobile devices. Option to enable load more for gird/masonry layouts. Loader selection options for load more. Light box selection options – 6 different lightbox available. Lightbox supports multi photos/videos and show in slider layout just like in native Instagram website. Social media share options – Share the Instagram feeds images in most popular social medias – Facebook, Twitter, Google+, LinkedIn and Pinterest with out leaving your site. Instagram widgets – 11 different eye caching instagram widgets available to display your fan/followers counts. Script and styles will load only when feeds are displayed on your site. And of course our plugin is translation ready.